Eat. Live. Laugh. and sometimes shop! : Summer-y Cocktail? Yes please! 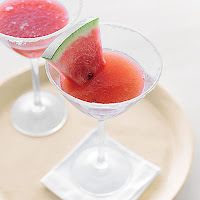 Watermelon sidecar: Whirl chunks of watermelon in a food processor until blended, then strain. Rub the rim of a martini glass with a cut lemon wedge, then dip rim in a shallow plate of sugar.Pour 3 tbsp. watermelon juice, 2 tbsp.brandy, 1 tbsp. lemon juice, and 2 tbsp.Cointreau into a cocktail shaker filled with ice. Shake thoroughly, then strain into glass. Garnish with watermelon wedges.